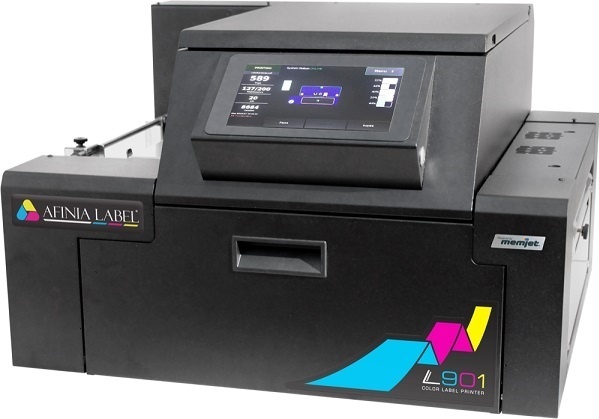 The L901 combines industrial design, exceptional image quality, and high production speeds with a new ability to service and maintain the printhead “on-the-fly.” This makes the L901 perfect for long roll-to-roll print jobs or inline integration with label finishers, applicators, dispensers, and more. Producing vibrant full-color prints in high resolution, the L901's new optimized ink formula delivers improved UV and water resistance, deeper blacks, and a longer printhead life. Large print volumes are now more economical, with five high-capacity 250ml CMYKK ink cartridges delivering an ultra-low cost per label. Producing vibrant full-color prints in high resolution, the L901’s new optimized ink formula delivers improved UV and water resistance, deeper blacks, and a longer printhead life. Large print volumes are now more economical, with five high-capacity 250ml CMYKK ink cartridges delivering an ultra-low cost per label. The XL Unwinder/Rewinder system pairs perfectly with the L901 to allow for continuous, roll-to-roll label production. Easily handle rolls up to 10? in diameter outside diameter for high-volume jobs and reduced media costs. The L901’s Memjet VersaPass printhead technology allows for on-the-fly maintenance, which makes for perfect inline integration with dispensers, applicators, label finishers and high-volume digital label press configurations. The L901 uses an ink formula from Memjet that offers improved UV and water resistance as compared to standard dye-based inkjet inks. This new formula also produces deeper blacks, is more responsibly-sourced(1), and prolongs the life of the printhead. Five high-capacity ink cartridges (CMYKK) offer extremely low ink cost per print, a top factor in assessing cost of ownership while choosing a printer. Learn the exact ink cost of your label design. A stationary printhead offers blazing fast print speeds of up to 60 inches (18m) per minute. Keep up with most high-volume jobs, whether in a continuous roll-to-roll setup or inline with a digital press. (1) L901 inks are made without chemicals that could be considered dangerous and/or harmful to the body and environment.